Susan is one of my inspirations as an author. She weaves great stories with faith, intrigue and suspense. 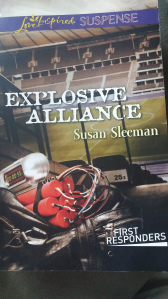 Another terrific book in an exciting series by Susan! Right off the bat, you’re entrenched in the action…a bomb is about to go off in a crowded football stadium. The gal who discovers the backpack device, Krista, has a shady enough past of her own to be intriguing. She worries about that background being discovered, but goes for help in the form of Cash Dixon, member of the First Response Squad. She alone is the person who can identify the bomber. Krista is plunged into the spotlight and as a result, her past becomes known to the team and others. Cash promises to keep her safe from the bomber’s retaliation, but the team is concerned, not only about Krista’s past but Cash’s obvious attraction to her. If Cash cannot keep his priorities straight, things can go very badly for him, Krista and the First Response Squad.